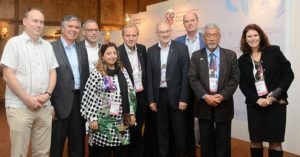 At its Plenary at the ICA congress in Kuala Lumpur in November, the following board members were acclaimed: Anders Lago from HSB, Sweden as President; Guido Schwarzendahl from GdW, Germany as Vice-President; Blase Lambert from CCH, UK as Treasurer; Christian Bengtzelius from Riksbyggen, Sweden; Linda Brockway from NAHC, USA; Errum Sharif Bhaiji from Karachi Co-operative Housing Societies Union, Pakistan; Mauricio de la Barra from Conavicoop, Chile; Hans Rupp from ABZ, Switzerland; Bernd Riessland from GBV, Austria. Congratulations to all and we look forward to a productive and successful 2018! 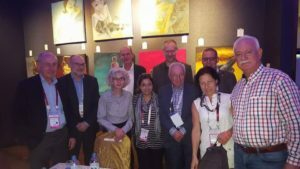 We also send thanks and good wishes to retiring board members, Nicholas Gazzard from CHF Canada who served as President for the past four years, Mehmet Aksoy from Turkkent in Turkey, Peter Schmid from ABZ in Switzerland and Herbert Ludl from GBV in Austria. 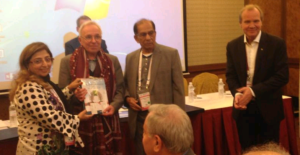 The CHI Plenary also saw the launch of a book on the history of co-operatives in Pakistan co-authored by Errum Sharif Bhaiji and Mohammad Sharif Bhaiji. This book is a symbol of the great support of co-operatives in Pakistan and their efforts that have made possible the further growth of co-operatives to this day. The contents also reflect the role of youth and women in the movement of co-operative awareness in Pakistan. Anyone wishing to obtain a free copy can email Mr. Ahsan Ali Thakur before year end. 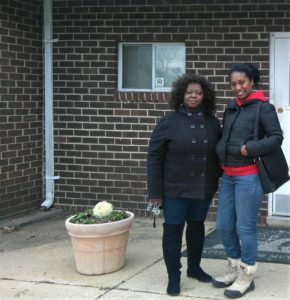 Julie LaPalme, Program Director for CHI, was in Washington DC in January and met up with Annie Hill, a member of 38 years at Second Northwest Housing Cooperative. Annie served on the board for 18 years. At first she had no experience being on a board and although she lived in a co-op she did not understand what a co-op really was. Shortly after joining the co-op board, Annie was introduced to the Potomac Association of Housing Cooperatives (PAHC). This is where she learned about her role as a director. Annie’s thirst for knowledge became addictive. She began reading the by-laws, taking notes and asking expert co-operators questions about things she didn’t understand. Another co-op in the DC area, Village Green Mutual Housing Co-operative, is a 120 unit row-house community built on several acres of rolling land in 1971 in Landover, Maryland, a suburb of DC. Like many housing co-ops of that vintage, Village Green is refinancing in order to fund capital repairs. The President, Rhonda Dozier, has lived in the co-op since her daughter was a baby and now that her baby is a college student, Rhonda can’t see herself living anywhere else. Rhonda is also Vice-President of PAHC. Last but not least, St. James Mutual Homes, a historic set of apartment buildings, was built in the 1930s in a former industrial zone of south Washington. Its construction represents a significant milestone in the development of planned housing for persons of moderate income and it helped to shape the redevelopment of the banks of the James Creek from an industrial tract to a planned housing district. It was one of the few buildings to escape demolition during “urban renewal” in the 1950s and became one of DC’s first cooperatively-owned complex purchased by a tenant group in 1967. Designed by prominent architect, Ashton P. Clark, who blended buildings and landscape reflected in the Garden Cities movement which advocated superior air circulation, more pleasing views and enhanced light in each apartment. St. James Mutual Homes was designated a historic landmark in 2015 by the Historic Preservation Review Board and is listed on the National Register of Historic Places. It’s been a busy year for CHI. 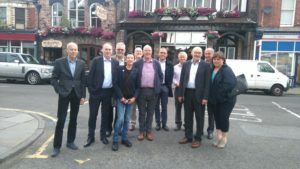 We launched a new website, held a board meeting in Liverpool where we hosted by Northwest Housing Services (NWHS) and the Confederation of Co-operative Housing. a mutual, not for-profit company which is totally owned and controlled by its customers, NWHS provide professional services to housing co-operatives, small housing associations, leaseholders and social enterprises. While in Liverpool we met with Homebaked CLT, a housing project with a cooperative bakery on site, is a tale of bringing back community to a neighbourhood left to decline, with and sometimes in spite of top-down plans for the Liverpool Football Club stadium area. 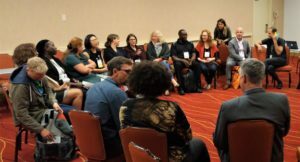 As part of its involvement with Urbamondes’ Social Production of Habitat initiative, CHI collaborated with Grounded Solutions Network (GSN) to secure funding which permitted 15 Canadian housing co-operatives and community land trusts (CLTs) to attend the of GSN’s Intersections conference, held from October 9-12, 2017 in Oakland, California. Participants also had the opportunity to learn more about conference’s local hosts, the Bay Area Consortium of Community Land Trusts and the work being done in the region to combat rising housing costs and displacement, through site visits. Another highlight was the conference’s Ignite Awards for affordable housing innovation being connected to the World Habitat Awards for the first time. Two Ignite finalists – Vivacite Societe Immobiliere Solidaire (Montreal, Canada) and Twin Cities Habitat for Humanity (St. Paul, United States) – have been forwarded on to World Habitat Awards as part of a joint selection process. All organizations, regardless of their involvement in Ignite are encouraged to share their stories on the Digital Social Platform and apply for the World Habitat Awards!